Sitting at my desk while high pressure brought a week of great weather and climbing conditions to the west coast was torture! 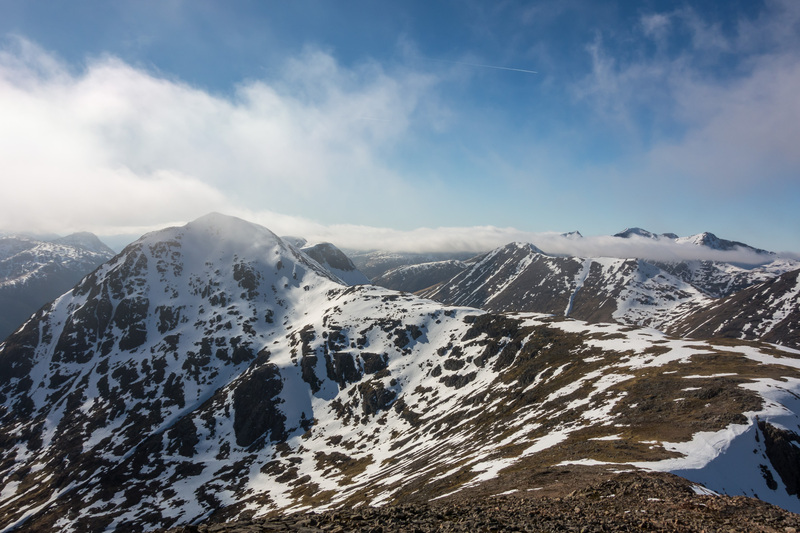 Luckily the high was forecast to stay put for the weekend, so it was two relieved climbers who charged over from Aberdeen intent on making the most if it. 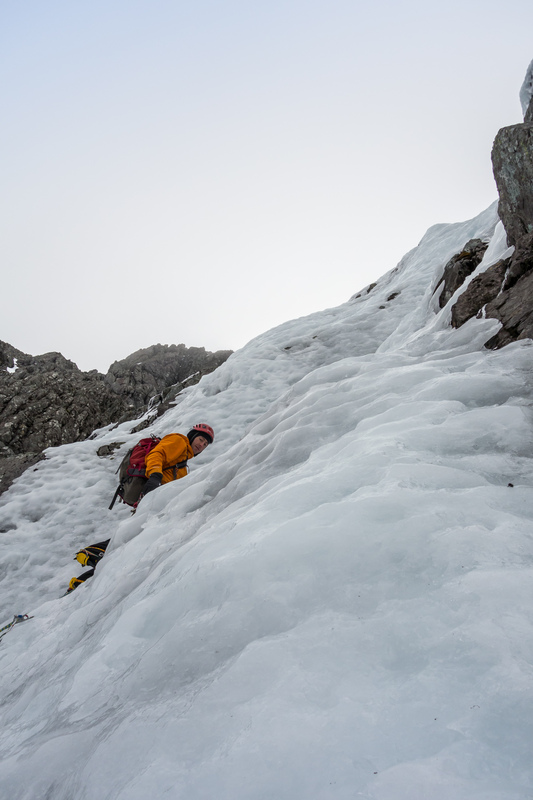 A stable high pressure in the early spring can open up a wealth of possibilities – diurnal temperature variations create excellent ice conditions on the high shady north faces while southerly aspects bask in the warm sunshine. Camping in the glen each night was bloody cold though! A temperature inversion was on the cards for Saturday and the thought of getting above the clouds on some warm rock was very appealing. 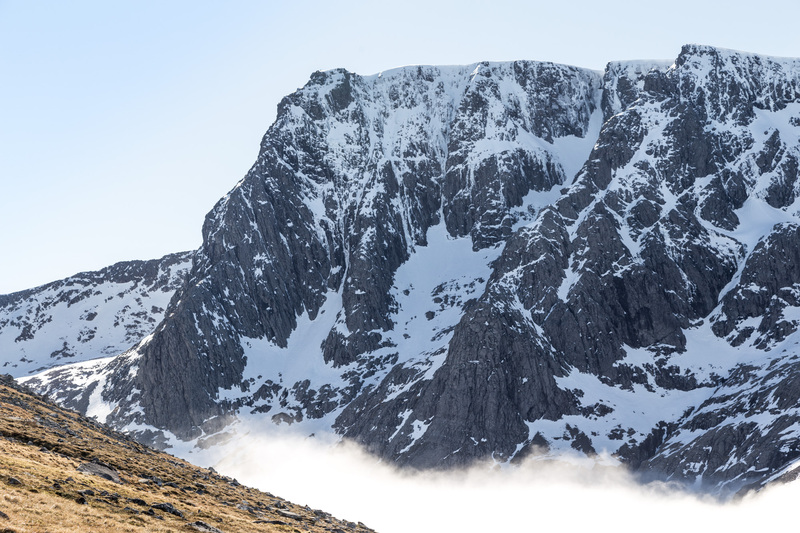 Having never done the classic moderate Curved Ridge, on Buachaille Etive Mor, this seemed like a prime opportunity. The scramble to the base of the ridge is a bit exposed at times and a few wet sections, thanks to snow melt from above, required care. We were soon under way though and moving together we made good progress over the series of short walls and towers, interspersed with easier scrambling terrain. It was great to feel warm rock under the skin again and the views as we climbed higher were incredible! 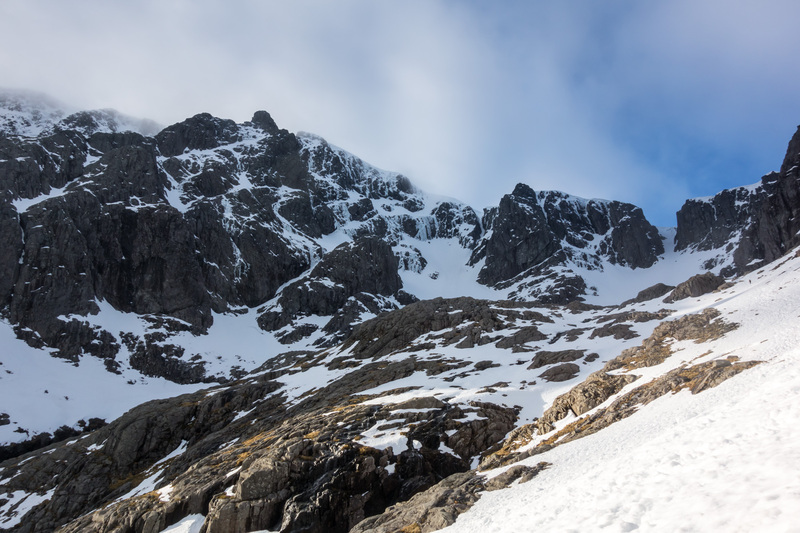 Crampons were donned for the final picturesque gully leading to Crowberry Tower Gap and the summit snow slopes. Much basking and lounging around followed as we drank in the views and waved to our friends on the CMD arête to the north. All too soon it was time to head down but the fun wasn’t over yet – the Coire na Tulaich headwall consisted of very chopped up, steep icy snow, which I found difficult to descend. We were still down in good time and after re-packing for a different kind of adventure we hit the Clachaig for dinner and beers! A much less leisurely start followed another frigid night and at 4 am we packed away the frost-covered tent, guzzled strong coffee and made for the north face car park of Ben Nevis. 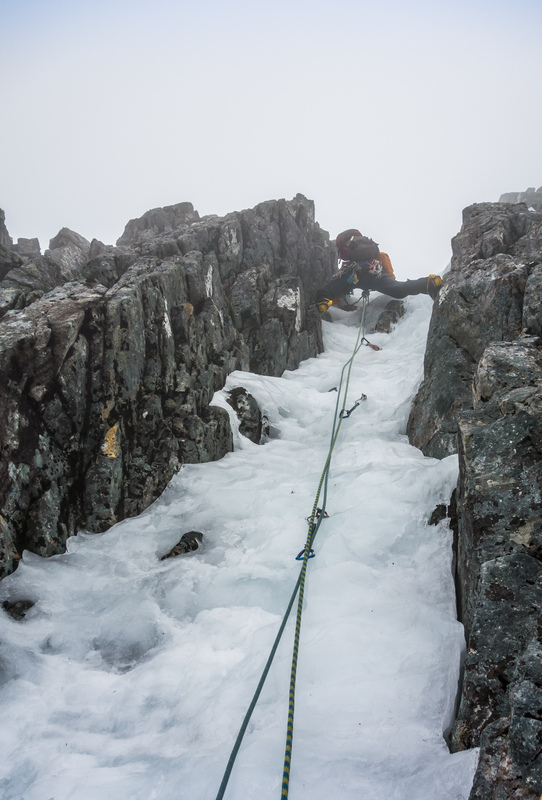 Despite the preceding week of warm temperatures, the lack of wind, rain and humidity meant the ‘wet bulb effect’ did a good job of preserving ice at higher elevations – rather than melting, the ice sublimates straight to vapour with the resulting energy loss keeping the surface temperature of the ice below freezing. 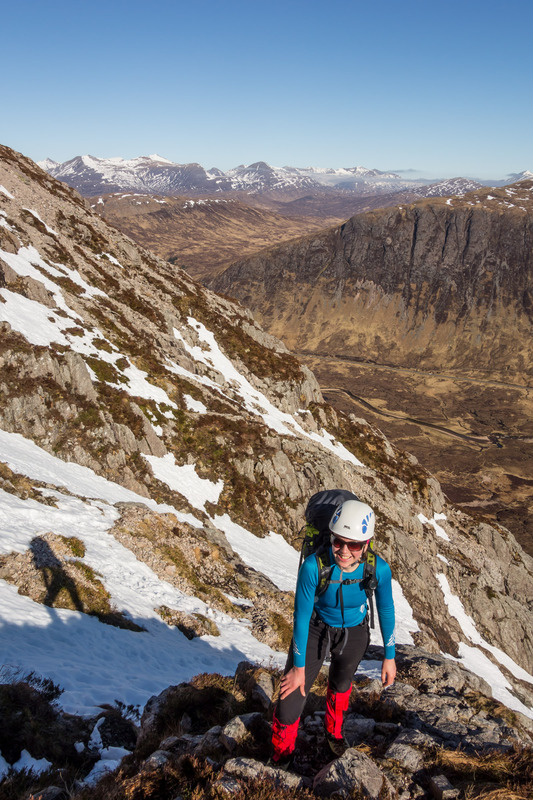 While the crowds headed for Observatory Gully, we sought solitude high on the north-west flank of Tower Ridge, aiming for The White Line on Goodeve’s Buttress. 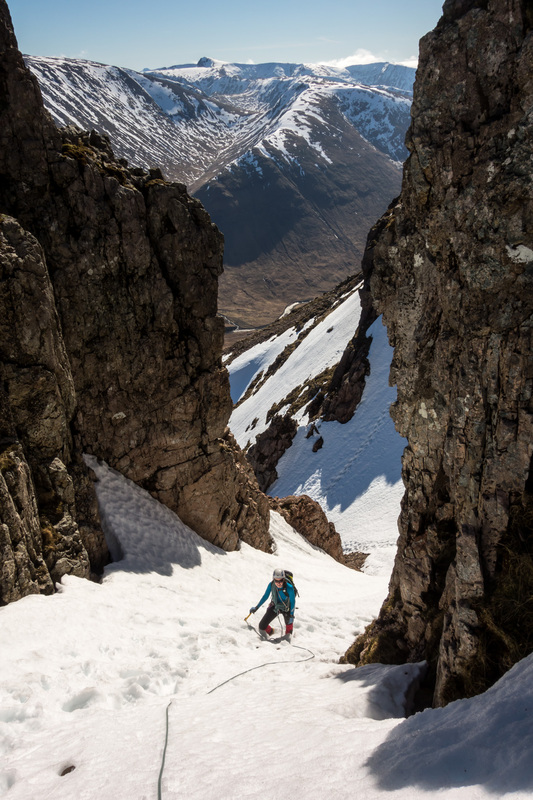 I had always been intrigued by this slightly less famous part of the mountain, reliably riven with drools of ice cascading down groove and gully systems, so it was great to at last climb one of the stand-out lines on the face. The Gutter and The White Line are the two prominent ice lines on the left of the image on Goodeve’s Buttress. 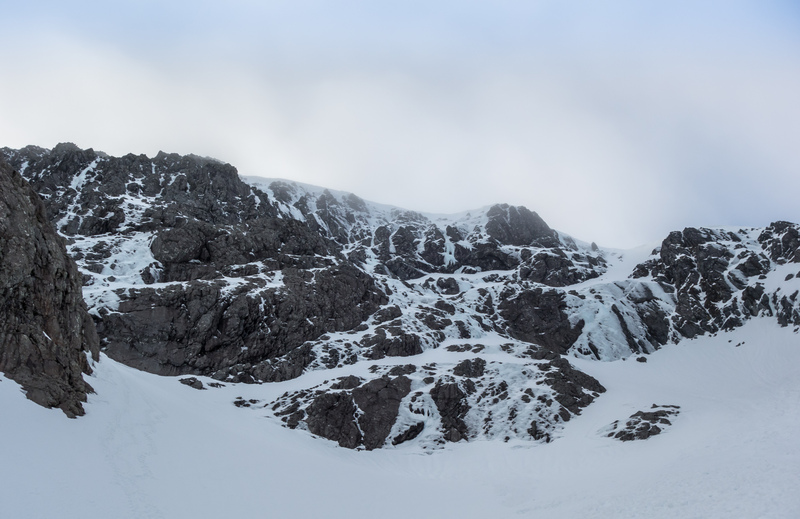 A very icy Raeburn’s Wall to the right. Plastic blue ice on pitch one – an excellent warm up! 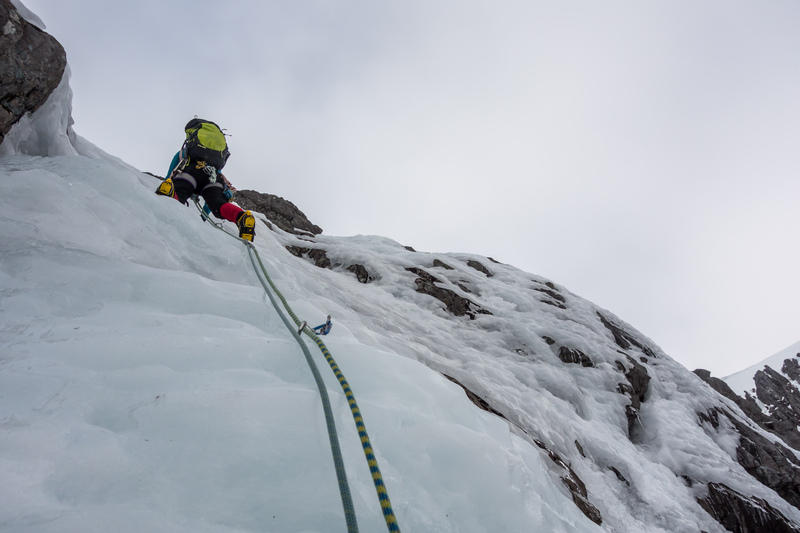 Only the first half of the pitch was visible from the belay – my calves were burning by the top! 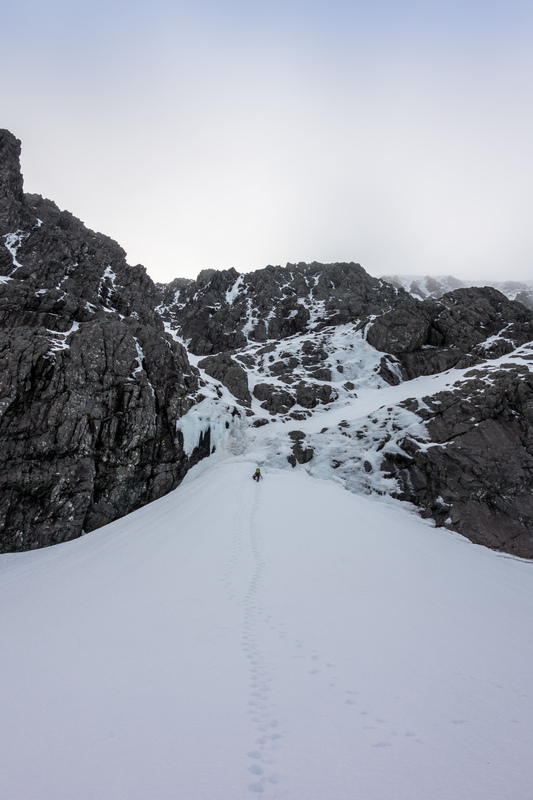 A dog-leg in our line bypassed the fickle third ice pitch, which appeared thin and detached, depositing us at the start of the final groove. I thought it was all over, but as Debs brought me up to her stance a hidden icefall materialised in a chimney leading up to the final snow slopes. 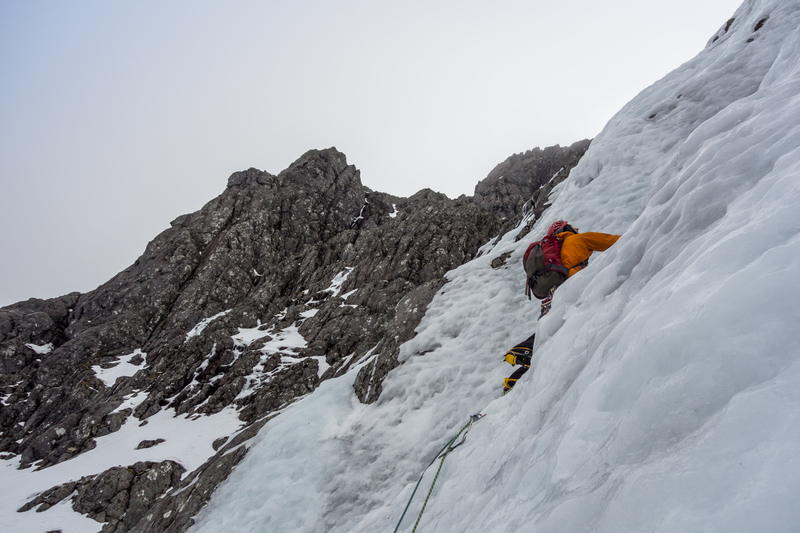 The final groove came as a bit of a surprise – great moves on steep ice to cap off an excellent route! More excellent climbing followed, with the crux of the route coming right at the top as I bridged out and over the final bulge. 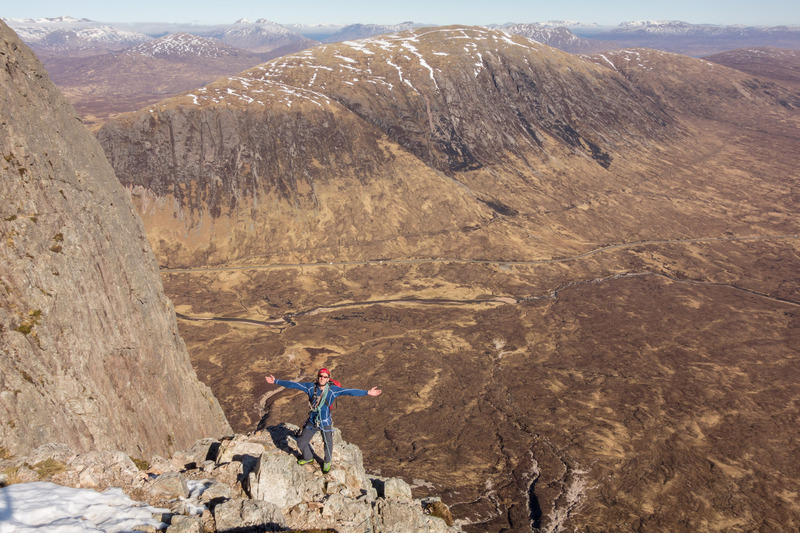 We hustled to the crest of Tower Ridge and on to the plateau above, grinning from ear to ear – what a route!